The allotment is a Brexit-free zone. On Saturday, one of the volunteer coordinators was fiercely enforcing it. As I planted my potatoes, I could hear her shout periodically, “I can hear you. None of that Brexit stuff round here please!” We escaped up to the fringes of Dartmoor on Sunday to a valley where there are meadows of wild daffodils. The kids splashed in the river. It was a glorious spring day, filled to bursting with sunshine. We heard a woodpecker drumming out its rhythm across the still sparse treetops. There were even butterflies amongst the daffodils. This entry was posted in Countryside, Family and friends, Growing things, Wildlife and tagged allotment, brexit, butterflies, daffodils, meadows, potatoes, spring, sunshine, woodls, woodpecker. Bookmark the permalink. Sounds like you had a wonderful time on the moor’s edge. 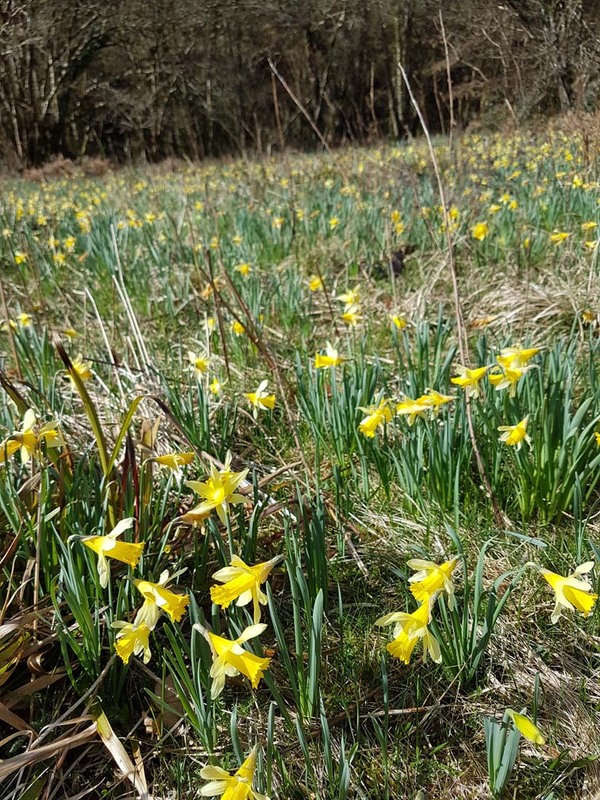 I haven’t seen that many daffodils for a very long time – delightful.